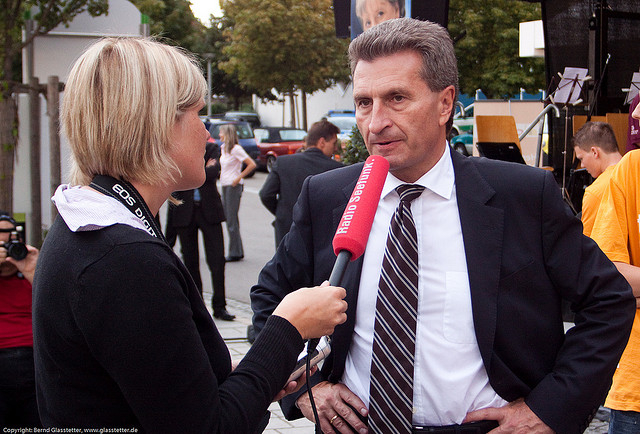 EU Energy Commissioner Günther Oettinger said the Commission-mediated talks to solve legal issues over the Gazprom-favoured South Stream gas pipeline could continue only if Russia adheres to international law in the context of the Ukraine crisis. In an interview with the Frankfurt Allgemeine Sonntagszeitung, he said that the discussion had come to a standstill because Russia did not want to accept EU energy legislation and because the crisis in Ukraine had eclipsed everything. “We will continue the talks if the Russian partners go back to adhering to international legal practice and if they are ready for constructive cooperation on the basis of our energy law” Oettinger said. He made clear that contentious issues had been discussed on a working level. “In the current situation, with civil war-like conditions in the eastern Ukraine and without Moscow’s recognition of the government in Kyiv, we will certainly not arrive at a political conclusion of our negotiations,” he stated. The South Stream gas pipeline will run under the Black Sea, from Russia to Bulgaria, where it will go ashore, with one section going to Italy via Greece, and another section going to Austria via Serbia, Hungary and Slovenia. Last December, the Commission said that all bilateral agreements (IGAs) for the construction of South Stream gas, signed between Russia and Bulgaria, Serbia, Hungary, Greece, Slovenia, Croatia and Austria, are in breach of EU law and need to be renegotiated [read more]. The Commission offered to help solve the legal problems. On 27 May, Bulgarian Prime Minister Plamen Oresharski met bilaterally with Commission President José Manuel Barroso and assured him that the South Stream pipeline will be build according to EU law. But as the two were meeting, it also became known that a Russian firm, whose owner is under US sanctions, will build the Bulgarian stretch of the pipeline [read more]. Later the same day, Barroso made it plain that the EU executive would impose infringements on Bulgaria regarding South Stream pipeline, whose construction, which is about to begin, is in breach of EU laws. Infringements could concern not only the operation of the pipeline, but its construction, EURACTIV was told. On Saturday, Gazprom CEO Alexey Miller stated that the Commission could not stop the implementation of the South Stream gas pipeline, that the construction will start this summer and that the first gas supplies would reach Bulgaria via its sea section in December 2015. He also said that Greece had requested a branch of the pipeline to link it to its grid. In end-April, Russia filed a lawsuit with the World Trade Organisation (WTO) against the European Union over the EU’s Third Energy Package. A memorandum signed last April envisages a branch of the pipeline to reach the Baumgarten gas hub near Vienna [read more]. Dnevnik, the EURACTIV partner in Bulgaria: ???????? ??????? ????????? ?? "???? ?????" ? ??????????? ??? ??????? Dnevnik, the EURACTIV partner in Bulgaria:” "??????? ": ??????? ?? ???? ?? ?? ??????? ?? ?????? "???? ?????"